U of L must account for $48 million to balance next years’ budget, possibly asking the university draw funds from salaries, halt projects and increase revenues. Interim President Greg Postel presented the budget during Feb. 16’s board of trustees meeting, blaming the shortfall on excessive spending by the university and its foundation. Postel said though the budget fall is large, it’s manageable from a business sense. To manage that, the university plans to keep faculty and staff salaries flat, implement a hiring frost, further reduce administrative pay and expenses and hold deferred renovations and maintenance requests. Opposed to a hiring freeze, which bars filling job vacancies, a hiring frost sets a benchmark for how many positions can be filled. 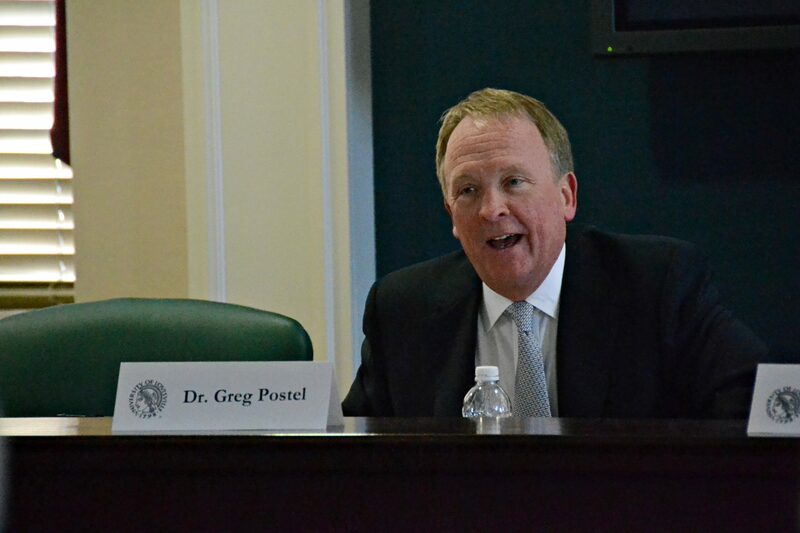 Setting U of L’s benchmark at 25 percent, Postel estimates at least 10 percent of empty positions would not be filled. “I think it’s going to be important for every faculty member and staff member at the University of Louisville to understand that this is a time when we need people to contribute and share their talents to the greatest extent possible, and for some people it’ll mean a little bit of a stretch,” Postel said. U of L faculty’s draft resolution responded to budget cuts, questioning transparency and asking for university constituents’ inclusion in budget conversations. That resolution will be presented to the Faculty Assembly Feb. 24 for discussion. Trustees cut costs further by absorbing leases for Bettie Johnson, Billy Minardi, Kurz and Community Park dormitories, moving management from ULH Inc., a U of L Foundation subsidiary, to the University of Louisville Real Estate Foundation. The move transfers management directly the university, allowing renegotiation of housing rates, bonds and property fees. Other revenue opportunities focus on building U of L, proposing new courses, 82 percent full-time faculty, more master’s programs, hospital operations’ revenues, student retention and development. Postel spoke with potential donors who want to “step back in” to support the university. Postel also said the university will uphold its promise not to raise tuition rates, regardless of shortened state funding. He also agreed not to accept additional compensation as interim president, guaranteed to him for his services. In lieu of compensation, Postel could earn a $100,000 bonus annually based on his performance by his tenure’s end. Postel’s interim president contract, released today, expects he will serve the position for at least a year and a half. Postel said he supports an external search for a permanent president and would consider stepping into the permanent role if the board asks. Trustees also discussed the university’s accreditation, focusing on Senate Bill 107. The original bill would let Governor Matt Bevin to remove “dysfunctional” educational institutions boards, but new revisions allows aggrieved trustees to plead their case before the Council on Postsecondary Education. U of L Board of Trustees Chair David Grissom expects SB 107 will appease accreditation standards, and said the revised bill will be presented to SACS President Belle Wheelan via conference call tomorrow. U of L’s faculty endorsed previous revisions, suggested by CPE President Robert King, charging university boards with removing fellow trustees for cause, including CPE in nominations for unequally represented boards and having the governor ask a “dysfunctional” board to step down before he removes them. Grissom also announced board member Junior Bridgeman resigned. Bridgeman, who traded his restaurants in early 2016 to become the third independent Coca-Cola bottler, said increasing work responsibilities led to his resignation. “As my family is moving into the Coca-Cola business, it became evident that I would not have the time to fully serve, so it was better to stop now before things really got going,” Bridgeman said. Bridgeman was a former NBA player, spanning 11 years between the Milwaukee Bucks and Los Angeles Clippers, who served roles on the foundation and board of trustees. He was a nominee for U of L’s interim president, losing to Postel. The board is scheduled to meet again March 16, weeks after U of L’s expected to send SACS information regarding three new possible violations to accreditation standards.